Q1. What should I write in the (b) area? A1. Please write the name of the wireless LAN access point you set in from the "Please read this first" manual included in the Sansan Edition package. If the settings for connecting by wireless LAN have not been done, you cannot use the access point written in (b) for the business card scanning function. Q2. I was using the access point in the (b) area to connect, but can I also use the network in the (a) area to connect and scan? A2. Yes, you can, but some settings are necessary. Here are the settings for this. 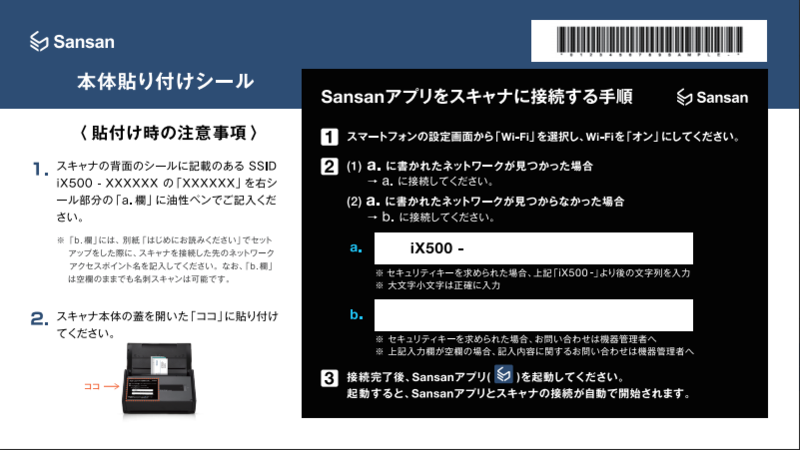 (1) Using a USB connector, please connect the ScanSnap iX500 Sansan Edition to the PC with the ScanSnap Manager installed on it. (2) Using this PC, please do the following. From "Start", go to "All programs", "ScanSnap Manager", "ScanSnap Wireless Setup Tool". (3) From "ScanSnap Wireless Setup Tool", select "Reset to initial settings". Q3. I wrote incorrect information for the access point on the sticker attached to the Scanner. Can I order a new sticker? Q4. I attached the sticker to the Scanner in the wrong place. Can I order a new sticker? A4. You cannot purchase new stickers alone. Please print the following image, and attach it to the Scanner.